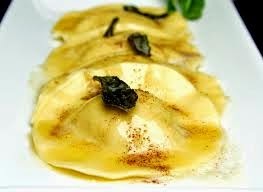 First Came Fashion: Browned Butter Sage & Butternut Squash Ravioli. By the silence at the table during dinner, I took this as a good sign. I made things super simple by purchasing the butternut squash ravioli from Trader Joe's. It was insanely delicious and my best meal to date. Directions: While the pasta cooks, melt butter in a saute pan and continue cooking until golden brown color appears in the thinnest liquid of the butter. Add sage leaves and remove from heat. Add lemon juice and set aside. Drain pasta and pour into saute pan and return to heat. Add the cheese, toss to coat and serve immediately.